There is nothing better than a nice porkchop smothered in onion gravy served over rice! Order New Cooking From The Crossroads of the Pacific - This book is perfect for all those who love to cook and read about food, but who also love to linger in the daydream of tropical and exotic locales. 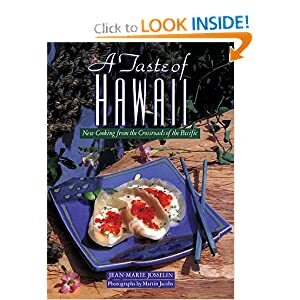 A Taste of Hawaii combines these two passions of travel and Pacific Rim cooking, which made this title irresistible, going beyond the typical Hawaiian "luau" cuisine, this book features Hawaiian food that is based on fresh ingredients combined with indigenous seafood and tropical produce. Start off by giving your pork chops a good rinsing in cold water. Next pat your pork chops dry with paper towels and set aside. In a small bowl form your seasoning mixture by combining and mixing together seasoned salt, garlic powder, black pepper and paprika. Rub about 3/4 teaspoon of seasoning on each pork chop. Next thoroughly coat each piece of meat with flour and set aside. Save all leftover seasoning for later use in onion gravy. Heat vegetable oil in heavy skillet over medium-high heat. When the skillet is hot enough add pork chops and brown on each side for about three minutes. Once your meat is browned remove it from the skillet and allow to cool on a plate covered with paper towels. Now it's time to form the onion gravy. Without removing any drippings add sliced onions to the skillet and cook until browned. Add remaining flour to the skillet and a very butter. Stir the onions and flour together until golden brown, paying careful attention not to burn the gravy. Add one cup water and 1 can beef broth to the onion gravy and stir. Bring to a boil over medium high heat. Add splash of shoyu for color and taste. Return pork chops to skillet, reduce heat to simmer, cover and cook for about 1 hour. The meat is done when it's tender. Add additional season to taste if necessary. Add a splash of cream to the gravy if desired to create a more creamy gravy. Great recipe. Would serve it again.